Parking Lot Maintenance is a specialty here at All Star Paving. Our 20 + yrs of experience puts your property in good hands. 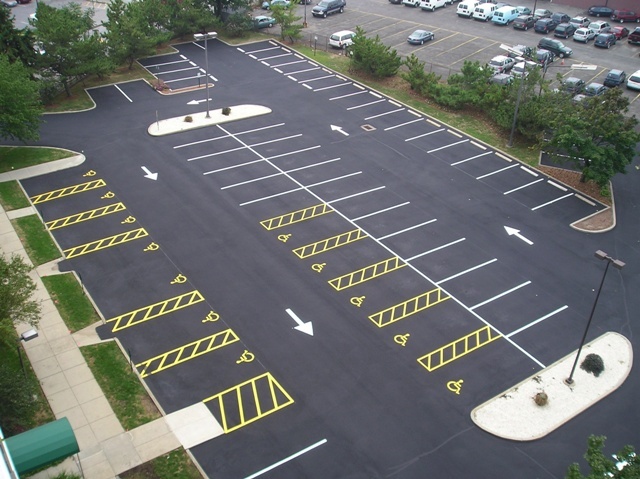 We understand the processes and techniques necessary to keep your parking lot functioning well, looking great and lasting it’s full expected lifespan. A fresh sealcoat and maintenance not only increases the curb appeal of your property, it actually helps extend the life and keep out the elements which degrade your surface prematurely. Why should I seal coat my parking lot? The most damaging element to your parking lot is the sun. The sun beats down on your parking lot and dries out the tars through a process called oxidation. Take notice of a newly paved surface in comparison to a surface that was paved a few years ago and you will see that the new pavement is black and the older has turned grey. The older parking lot has started to oxidize and subsequently become less flexible. When this happens the parking lot starts to lose the ability to expand and contract with the hot and cold weather. Seal coating an asphalt surface 1-2 years after installation will lock the tar in and protect the parking lot from oxidation. Continuing to seal the parking lot every 2-3 years after will continue the protection as well as filling small cracks as they appear. There are two common mistakes people make with seal coating. They either wait too long after the installation to where the parking lot is already cracking or they seal the parking lot to often to where the sealer gets to thick and it starts to crack. Our experienced Sealcoating team at All Star Paving will not let that happen. We give every paving client the “Life Extending” Parking Lot Maintenance program. What is the “Life Extending” maintenance program? You will receive an email notice on the one and two year anniversary of your parking lot installation. This will remind you to get your parking lot sealed. Once we have sealed your parking lot we will send you an email on year two and three to remind you it’s time for us to take a look at your parking lot. These alerts will keep you on top of the maintenance of your parking lot and put you on a path to getting the longest useful life out of your parking lot’s asphalt surface. Here at All Star Paving we stand behind our work 100% and want our clients and potential clients to be as informed as possible. For a breakdown of when you should sealcoat your parking lot vs. when you should pave your parking lot click on the following link. Parking Lot Sealcoating vs Paving We are confident that this will help you understand the process to maximize the life of your surface and save money in the process. Parking Lot Maintenance Programs -All Star Paving Stamford Ct.